Antibiotics are a powerful resource that allows us to safely perform surgery, treat cancer with chemotherapy, and recover from infections that over 100 years ago would have killed even the fittest among us. We are seeing however, a dramatic increase in infections with bacteria resistant to the killing effects of antibiotics (termed drug-resistant infections). These are antibiotics that until recently used to be effective. These resistant bacteria make many infections more and more difficult to treat – in some cases causing patients to die because we no longer have antibiotics that are able to manage the infection. 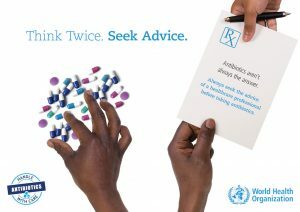 A major driver of drug-resistant infections is the overuse and misuse of antibiotics. We outline some of the key reasons for this below. Firstly, some health problems cannot be treated with antibiotics, and it is important to know which ones they are. In some cases, health problems that can be treated with antibiotics need consideration about the right antibiotic for each person. For example, it would be important to consider whether people are taking other medications, whether they have got any other health problems, and even their preferences. Talking to a health professional helps build relations that are proven to be essential for the experience of people related to antibiotic use. We now know that whilst patients are eager to receive more information about their use of antibiotics, previous experiences about having antibiotics prescribed (or not) gradually imprints expectations about antibiotics. Therefore, having the opportunity to discuss antibiotics with a healthcare professional may also have an impact on future attitudes and expectations when you feel unwell. As all medications, antibiotics can have negative side effects that may be important to your current and future health. Often without previous discussion with a healthcare professional, it may be difficult to forewarn patients about such side effects and what to do should they appear. The ability to be able to warn someone about certain antibiotics may encourage them to keep taking them if they experience the side effect, or even ensure that they seek help immediately in rarer cases. The conversation between healthcare professionals and patients about antibiotics are shaped by many factors that are not just related to health. These can reflect cultural beliefs and traditions, expectations, power relations between professionals and patients, the skills that the patient may have to deal with health problems, as well as social circumstances. Patients may feel compelled to access, or request antibiotics as a quick solution to a health problem that may prevent them from going to work. However, antibiotics are not always the solution and in some cases may worsen the problem due to the side effects that patients experience. Conversations with healthcare professionals allows people to receive useful information about self-care measures that can resolve symptoms and prevent further health problems. For example, painkillers, fluids, and rest may be all that is required to deal with a cold. Being up to date on influenza vaccination, and washing hands thoroughly and correctly could ensure that the risk of catching infections is much reduced. Studies show that whilst citizens are in agreement with healthcare professionals that the main reason causing drug-resistant infections is antibiotic use, they are not aware of the range of factors driving antibiotic use. Therefore, facilitating opportunities for these conversations to take place would be beneficial to raise awareness and optimise antibiotic use. Encouraging citizens to engage with professionals in conversations about antibiotics would require that professionals embrace communications approaches and skills that result in meaningful and actionable information for patients and ultimately shared-decision making. Considering that the information related to infections is difficult to understand and process in the time allowed for typical consultations in primary care and due to the limited familiarity of the average citizen with scientific jargon/language, such conversations may be difficult. However, through the use of information aids and a greater understanding of what information patients desire, we may be able to facilitate meaningful engagement with decision-making even in the most time pressured of situations. In summary, we all have a role in using antibiotics more responsibly, through better communication approaches that encourage shared-decision making between citizens and healthcare professionals.